Is the Einstein Cross a gravitational lens (a galaxy-sized fun-house mirror), or is it a redshift anomaly, proving that the “redshift-equals-distance” assumption is fatally flawed? In the mid-1980's, astronomers discovered these four quasars, with redshifts about z = 1.7, buried deep in the heart of a galaxy with a low redshift of z = .04. (The central spot in this image is not the whole galaxy, but only the brightest part of the galaxy's nucleus.) This could have been seen as a crucial verification of Halton Arp's discordant redshift associations. It could have been proof that the redshift-equals-distance relationship is fatally flawed. Instead, Einstein's space-warping principle was invoked, and astronomers announced they had discovered a single distant quasar split into four images by the gravity of the foreground galaxy. A galaxy-sized fun-house mirror! But how well does the image fit the theory? Einstein predicted that light from a distant object that was gravitationally warped around a massive foreground object would form arcs or even a full circle. Here we see four bright spots and no ring-like elongations. In fact, all four of the bright spots are elongated in the wrong direction: they stretch toward the galaxy center. More observations were undertaken. Using the Hubble Space Telescope, a friend of Arp's documented that quasar D (right side of photo) is physically connected to the nucleus of the galaxy. 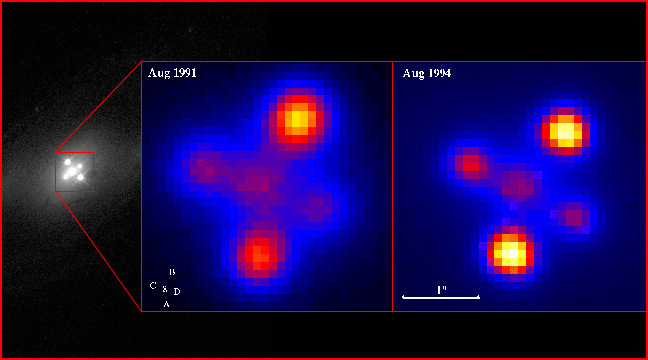 Later, a high redshift connection was discovered between quasars A (bottom) and B (top) which passes in front of the connection between the nucleus and quasar D. But these observations went unnoticed: the journal which usually prints results from the Hubble Space Telescope rejected this announcement twice. Mathematical analysis, too, casts doubt on the gravitational lens theory. The faint foreground galaxy would need to be much bigger and brighter in order to accomplish this lensing feat: In fact, it would have to be 2 magnitudes brighter than "conventional quasars," the brightest objects known. These two photos show brightness changes observed over a period of three years. The lensing explanation is that the warping of the light varies when individual stars pass in front of the quasar. Arp's explanation is that the galaxy has ejected four quasars, which are growing brighter and moving farther from the nucleus as they age.